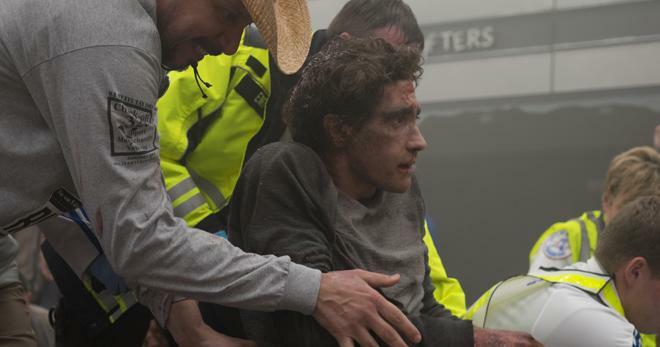 Inspired by the true story, Stronger stars Jake Gyllenhaal as Jeff Bauman, a working-class Bostonian who was at the 2013 marathon when the bomb blast occurred and he tragically lost both of his legs. After regaining consciousness Jeff was able to help law enforcement identify one of the bombers, but his own battle had just begun. Jeff's deeply personal journey tests a family's bond and defines a community's pride as he overcomes adversity to become the living embodiment of "Boston Strong." Whenever an inspirational true story hits the airwaves, we often have a tendency to view the individuals involved purely as symbols -- as broad representations of some greater ideal or sense of determination that we all aspire toward. But in reality, people are far more complex and vulnerable than any simple headline of heroism or survival could ever imply. Marked by an admirable level of authenticity and a respectful "warts and all" approach to its storytelling, David Gordon Green's Stronger digs into that deeper truth, effectively peeling back the aching layers of raw humanity beneath its inspiring real-life tale of growth in the wake of tragedy. Based on Jeff Bauman and Bret Witter's non-fiction book of the same name, the film follows Jeff (Jake Gyllenhaal), a good-natured, average Bostonian who lives with his mother and spends most of his free time drinking with his buddies. 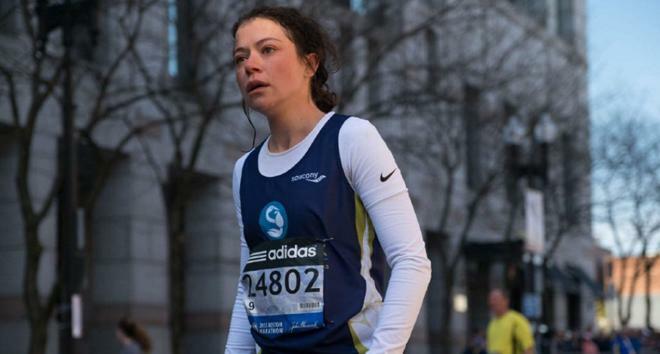 In an attempt to help woo back an ex-girlfriend named Erin (Tatiana Maslany), Jeff decides to cheer her on at the sidelines of the 2013 Boston Marathon. But when a bomb goes off during the event, Jeff becomes the victim of a terrorist attack, losing both of his legs in the process. Temporarily broken yet not defeated, he attempts to recover from the ordeal, forcing him to face painful setbacks and eye-opening revelations about himself. As one might expect, much of the movie ends up focusing on Jeff's rehabilitation and the strong bond that forms between him and Erin. Their relationship becomes the story's emotional center, allowing Gyllenhaal and Maslany to share the heavy lifting as Jeff struggles to overcome his physical and emotional limitations and Erin struggles to shoulder a new set of responsibilities and caretaking duties. All the while, the increasing public interest in Jeff's story adds another layer of stress to the whole ordeal as the world tries to turn him into a symbol for "Boston Strong" hope. But Jeff's tragic circumstances and reluctant status as an inspiring figure do not magically negate the flaws he already had before the accident. Instead, they only seem to magnify them, bringing his lingering immaturity and unreliability to a head. And it's in this regard, that Green starts to differentiate his film from other comparatively sugar-coated true-story tales of inspiration. Don't get me wrong, the movie still hits certain familiar beats as Jeff gradually works to overcome mounting obstacles in his rehab and relationships, but the seemingly honest portrayal of his shortcomings and self-inflicted setbacks presents a sobering examination of imperfect recovery and ongoing emotional growth. Helping to bolster this engaging narrative arc, is Green's thoughtful aesthetic approach, which blends a fairly naturalistic style with key camera setups that work to enhance the emotion on screen. One particularly impactful sustained shot features Jeff's face at the edge of the frame as the doctors take off his bandages for the first time following his amputations. As we stay fixated on Jeff's agonizing expression in the foreground, his legs are kept out of focus below him in the background. Eventually, Erin's face enters the opposite edge of the frame as she comes to support Jeff through the trauma, visually connecting the couple while the source of Jeff's pain remains blurred, yet ever-present between them -- figuratively and literarily. Using understated yet potent stylistic flourishes like this and a refreshing refusal to completely sanitize its subjects, Stronger ends up weaving an affecting tale that highlights inspiring strength without ignoring lingering flaws. As we watch Jeff gradually embrace his place as a public symbol for hope, Green simultaneously strips down the unrealistic expectations that come with such a role -- revealing the deeper humanity that gives Jeff's story its true power. 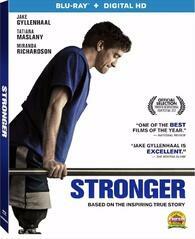 Lionsgate presents Stronger on a BD-50 Blu-ray disc housed in a keepcase with a cardboard slipcover. A insert with instructions for an UltraViolet/iTunes Digital Copy is included inside. After some skippable trailers, the disc transitions to a standard menu. The packaging indicates that the release is region A coded. The movie is provided with a 1080p/AVC MPEG-4 transfer in the 2.40:1 aspect ratio. Delicately stylized with cool tones and a naturalistic aesthetic, this is an inherently modest yet effective image. The digital source is mostly clean and pristine, though there is a hint of noise and some fleeting artifacts in a couple of shots. Clarity as a whole is strong, with a relatively sharp look marked by distinct fine textures and details in faces, costumes, and sets. Depth is also solid, particularly in wider shots set during a hockey and baseball game. The overall color palette emphasizes blues and greys, resulting in an intentionally undersaturated appearance for most of the runtime, though a few keys scenes start to evoke warmer tones. Though this choice does limit the film's sense of pop, the aesthetic works well with the narrative. Contrast is balanced well but whites can look a tad overexposed and blacks veer a bit grey here and there. In general, this is a technically proficient transfer that respects the movie's intended style well. That style is definitely less conventionally impressive than your average blockbuster, but the desaturated visuals suit the film's tone. The film is presented with an English DTS-HD MA 5.1 track, along with optional English SDH and Spanish subtitles. Much like the video, the mix here is relatively modest in nature but still does a good job of enhancing the movie's atmosphere. Speech is crisp and easy to hear throughout with no technical issues to report. The track's scope is fairly restrained, though appropriate ambience is spread effectively throughout the soundstage, helping to breathe some life into various locations. Directionality is also employed well, transitioning objects like cars and characters' voices to the left and right when called for. Scenes set at a hockey game and baseball game prove to be especially lively, with solid surround use as applause and crowd reactions hit the rears. Design work during the bombing sequence itself is also noteworthy, as the commotion of the crowd, deep LFE explosion, and approaching sirens all create a potently concise auditory experience. As a character-driven drama, Stronger lacks the bombast of more aggressive films, but the thoughtful mixing here creates an effective sense of mood and environment. Faith, Hope & Love: Becoming Stronger (HD, 29 min) – Presented in 1080p with Dolby Digital 2.0 audio, this is an informative behind-the-scenes featurette with cast & crew interviews and on-set footage. The participants discuss the true story source material, casting process, actor/director relationship, makeup/effects used to erase Gyllenhaal's legs, and the use of Jeff's real doctors and therapists in the movie. Likewise, we also get to hear from Jeff himself. Though I wish there were a few more extras on the disc, this is a very worthwhile inclusion. David Gordon Green's Stronger presents an affecting true-life tale of recovery and growth, highlighting inspiring strength without ignoring its protagonist's flaws. The video and audio mix are both comparatively modest in design, but the style suits the material well. Though certain narrative beats are a bit familiar and the disc does lack much in the way of supplements, the movie probes deeper than most inspirational biopics and the lone included featurette is worthwhile. Recommended.